From the illustrated fantasy adventure, Urshurak! Created by Greg and Tim Hildebrandt and Jerry Nichols. This beautifully rendered pencil illustration captures the likeness of Ali Ben Kara. He is not happy in this moment, as he has just been tossed into a pool by the giant Norseman, Tar-Volmar in one of their sparring matches. Ben Kara has a temper, but he is also a noble warrior. Even in his moment of embarrassment he stands powerfully! 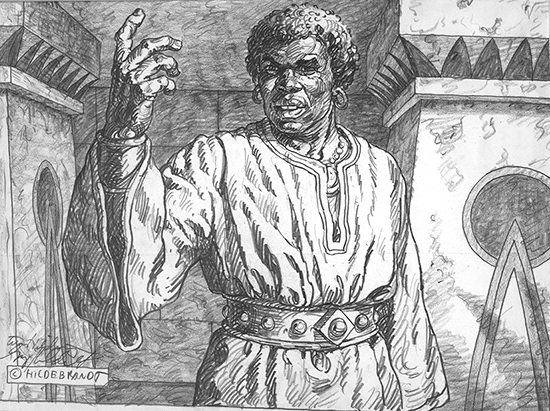 This illustration appears on page 127 of the book.